This Do Nothing Cake is an easy, delicious crowd pleasing dessert. It’s an easy no mixer cake, which is just kind of my cake! Learn why it’s called a Do Nothing Cake which has been around since the 1940s! We need to talk about this easy Do Nothing Cake, which is also known as Texas Tornado Cake. I’ve seen this recipe floating around Pinterest for ages, and finally got around to trying it. The original recipe calls for 2 cups of sugar (not counting the frosting) and I felt that with the added crushed pineapple in the cake batter, the cake would turn out too sweet, so I cut the sugar in half. This cake is basically a dump / poke cake, and is super easy to make. Just mix together all the cake ingredients, and bake it. And the frosting is super easy too. It’s cooked over the stove top and the combination of butter, evaporated milk, sugar, and walnuts and shredded coconut is just divine! So why is it called Do Nothing Cake? It may be argued that this cake is technically not a do nothing kind of recipe, because it’s from scratch and does involve a few ingredients. In today’s world, compared to the boxed cake mixes we can easily buy, this is technically not a Do Nothing Cake. But this cake dates back from the 1940’s and for that era it really was an easy cake! 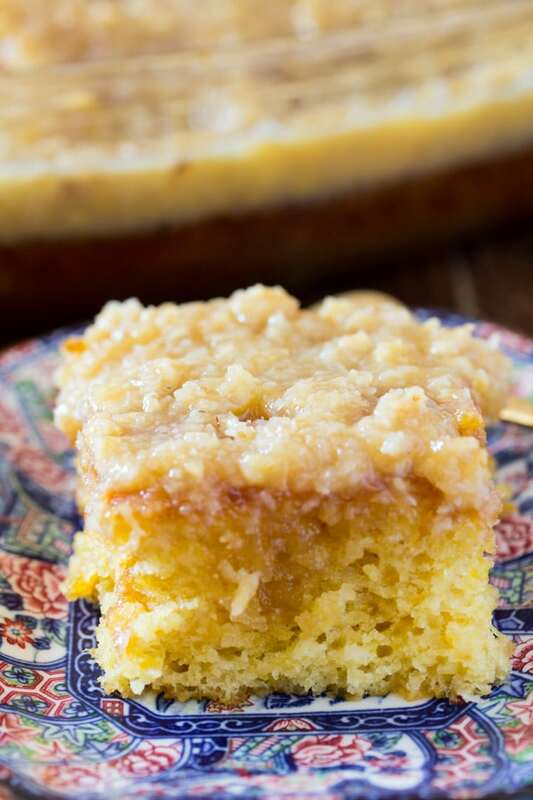 The interesting part is that this cake requires crushed pineapple which goes into the batter itself, and the batter itself doesn’t call for oil or butter. I still think it’s a very easy cake, since it requires no electric mixer, no softened butter to beat, no multiple bowls to make the batter etc. Even the frosting is super simple, since it’s cooked on stove top. This cake batter is interesting because it doesn’t call for oil or butter, but it does call for crushed pineapple. Which adds such a lovely moistness to the cake!! In a mixing bowl, combine flour, baking soda, crushed pineapple, vanilla and sugar. Just combine until it’s fully incorporated. Transfer to a baking pan and bake! The frosting is very easy and is actually made on the stove. It calls for evaporated milk, which is also an interesting frosting ingredient. You start by combining the butter, evaporated milk, and sugar in a saucepan and cooking until its slightly thickened (about 5-7 minutes). Add in the walnuts and shredded coconut, until combined. Set aside to cool. 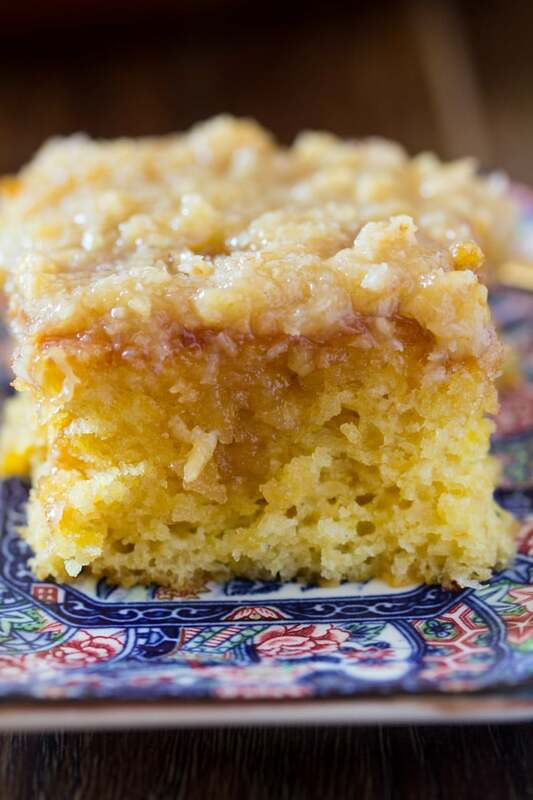 Classic Do Nothing Cake is basically a poke cake, so as soon as its out of the oven, poke holes on the entire surface with a fork or the back of a wooden spoon. Pour over the frosting all over the surface of the cake evenly. Let the cool cake, and serve immediately. NOTE: For the full recipe with ingredient amounts and detailed instructions, please scroll down to the recipe card. I do hope you try this easy cake, and if you do, I’d love to hear what you thought of it!! Note: This post was originally published on 27th July 2017. I’ve updated it for more detailed instructions, but the recipe remains the same! 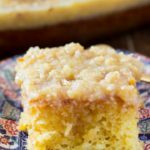 Do Nothing Cake is also known as Texas Tornado Cake - it's a super easy pineapple poke cake topped with a delicious coconut and walnut frosting. For the cake: Preheat oven to 350 F (175 C) and prepare a 9 x 13 inch baking pan by lightly greasing it. In a mixing bowl, combine the flour, baking soda, and sugar. Add in the sugar, eggs, vanilla extract and crushed pineapple. Mix until fully combined. Transfer the cake batter to the prepared baking pan and bake the cake for about 30 minutes, or until it's cooked in the middle. For the frosting: In a saucepan, combine the butter, evaporated milk, and sugar. Cook until slightly thickened, about 5-7 minutes. Add in the walnuts and shredded coconut and mix until combined. As soon as the cake is out of the oven, poke holes into the cake using a fork or the back of a wooden spoon. Immediately pour over the prepared frosting. Let cool, and serve. « Eggless Chocolate Mousse – Only Three Ingredients! What to add if i want to make it eggless?